For more than 40 years, LDRA has led the market with software quality tools that automate code analysis for safety-critical and security-critical applications. Disasters such as the Piper Alpha oil rig explosion and the Gulf of Mexico oil spill have increased scrutiny for both safety and security in industrial applications such as mining, oil & gas, heavy equipment, and process control functions. Many applications within the industrial control sector require compliance to the IEC 61508 standard as it applies to the functional safety of programmable electronic systems in general, or to ISO 13849 with its more specific focus on machine control systems. However, complying with these functional safety standards using traditional manual methods can be time-consuming, costly and error-prone. The demands of IEC 61508 and ISO 13849 mean that companies increasingly want to leverage certified software tools to help demonstrate compliance, and to add rigour and automation to their development process. LDRA’s software quality and test tools meet the highest standards for security and safety-critical software development, minimizing risk and expediting development, verification, and deployment. 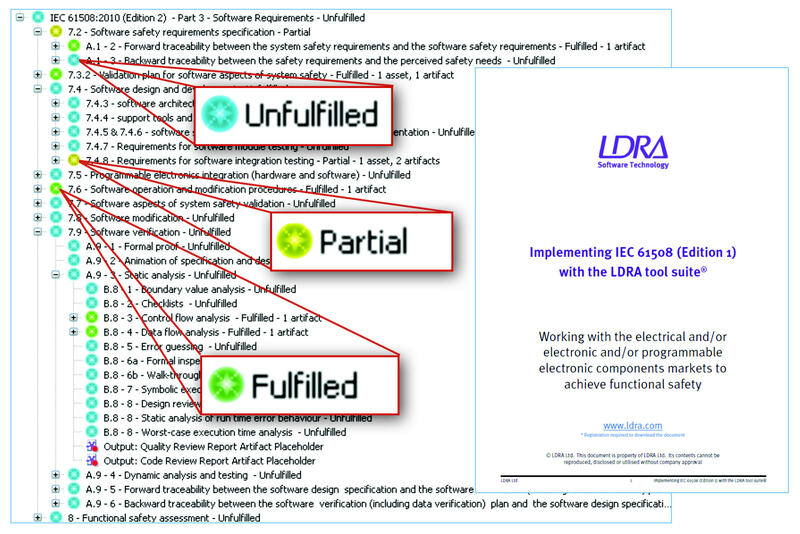 From requirements and safety objective traceability through design, development, and verification, LDRA tools can help your team develop safer and more secure software systems faster and more cost-effectively. TBmanager is the only requirements traceability solution that supports the tracing of requirements, development, and verification artifacts and activities throughout the entire software development life cycle. This bidirectional traceability ensures complete coverage and impact analysis through all phases of development, from a requirement through development to verification, and the production of evidence and documentation in a comprehensive requirements traceability matrix. TBvision’s static analysis capabilities simplify the enforcement of coding standards across your organisation, improving the overall consistency and quality of the code. TBvision helps your team develop and enforce the coding standard that is right for you from in-house best practices and guidelines to industry coding standards or a combination of in-house and industry standards. Examples of supported standards include MISRA C, MISRA C++, CERT C, CERT C++, CERT Java, Netrino C, and JSF++ AV. The LDRA tool suite lets your team meet the most rigorous coverage analysis requirements, including statement, branch/decision, procedure/function call, Modified Condition/Decision Coverage (MC/DC) (as required for IEC 61508 ASIL Level D), and dynamic data flow. The TBobjectBox module is the only direct way to relate code coverage at the source code level with that achieved at the object code level to achieve complete object code verification (OCV). TBrun helps developers avoid the delays and costs caused by the discovery of defects late in the software development or system integration testing cycle. Most importantly, TBrun eliminates the vast majority of tedious, error-prone manual testing techniques by leveraging rigorous analysis of the source code and automating the generation and execution of test cases against that code. TBrun quickly and easily augments the generated code to ensure proper verification of the application under development. LDRA provides support for the qualification of its tool suite for both structural coverage analysis (SCA) as well as for programming rules checking (PRC). The LDRA Tool Qualification Support Packs (TQSPs) contain the test cases to demonstrate both the SCA and PRC capabilities of the tool suite itself. In addition, associated documentation for the development and verification of the product is provided, including plans, procedures, and expected results. LDRA brings its long and enviable security and safety record in rigorous standards-based markets such as aerospace to the industrial control software market. TÜV SÜD and SGS-TÜV SAAR have certified the use of the LDRA tool suite for security and safety-critical development in the industrial safety market under IEC 61508-3:2010, in recognition of LDRA’s own formal development and verification process and the capabilities of the LDRA tool suite.